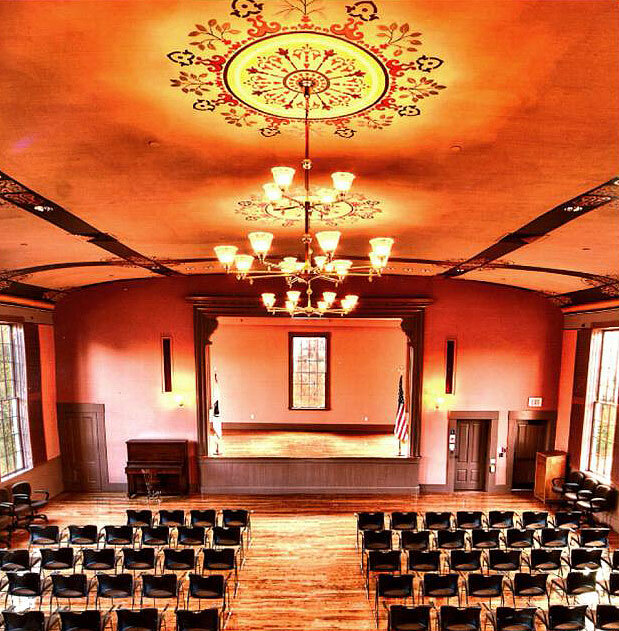 | Presenting the Beautifully Restored Town Hall in Sandwich, Cape Cod's Oldest Town: Community Events, Meetings, Movies, Shows, Talks and Tours in a unique and historic setting. 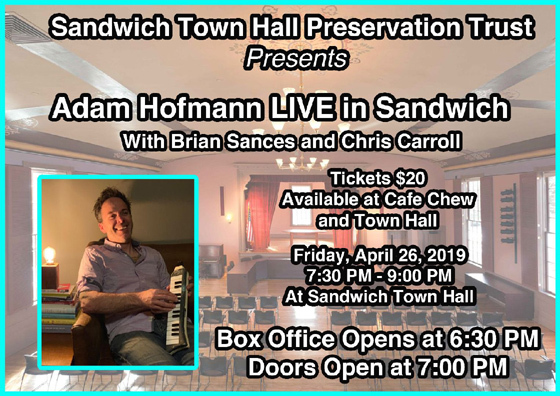 You are invited to join in the fun and support the Sandwich Town Hall Preservation Trust by attending a wonderful concert that will appeal to everyone staring local rock musician Adam Hofmann at Town Hall Friday April 26th, 7:30 – 9:00 p.m.
Adam will be joined by Brian Sances and Chris Carroll on the Glass Town Stage in Sandwich’s charming historic Town Hall, 130 Main St. Enjoy the music and the community as well as support the “Trust,” whose mission is to help preserve Town Hall. Tickets are $20 each and available now at Town Hall, Café Chew and on line at Evenbrite. On concert night the box office will open at 6:30 pm, doors at 7:00 and the concert will begin at 7:30. There is open seating. For more information call 508-776-3256. Special thanks to Town Hall staff, Sandwich Community Television, Sandwich Print Shop, and Café Chew. BECOME A MEMBER AND GET OUR MONTHLY NEWSLETTER! The Mission of the Sandwich Town Hall Preservation Trust is to support the continued stewardship of the historic Sandwich Town Hall, to assist the Town Manager and staff as a resource for volunteers, events, and programs, to provide, if feasible, funds for special purposes, and to make recommendations for the perpetual protection and enhancement of the Sandwich Town Hall as a major cultural, functional, and historic asset of the Town of Sandwich and the Commonwealth. The beautifully restored Town Hall in Sandwich, Cape Cod’s Oldest Town, features Community Events, Meetings, Movies, Shows, Talks and Tours in a unique and historic setting. Built in 1834, Sandwich Town Hall was restored to its former glory in 2009. The second floor ballroom where movies and theatrical productions are presented is particularly beautiful with its historically accurate ceiling stenciling of tan and brown paint and gold leaf. There’s also a theatrical stage, balcony seating and fully restored historic shuttered windows. The Sandwich Town Hall was granted a Preservation Award for Rehabilitation & Restoration by the Massachusetts Historical Commission in 2011. The Town Hall has been in active use as the seat of Town government for over 175 years. An award-winning rehabilitation and restoration was completed in 2010. Your donation to the Sandwich Town Hall Preservation Trust helps to support the stewardship of our historic 1834 Town Hall and to perpetuate it as a major cultural, functional, and historic asset of Sandwich. In simple terms, the Trust believes the more the community uses the Hall the more the people will appreciate it as a unique space and the more it will be protected. 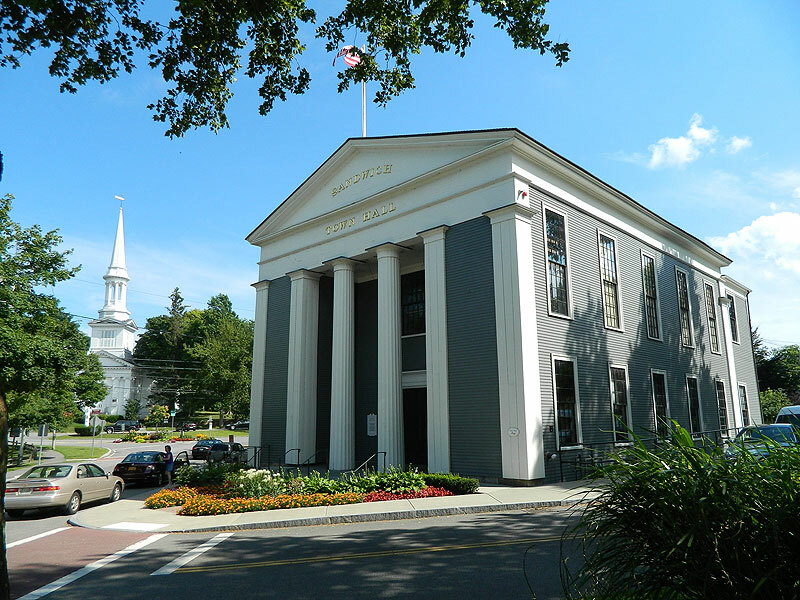 The Sandwich Town Hall Preservation Trust is a non-profit, 501(C)3 organization.